We absolutely love working with other creative businesses. In recent years we’ve worked hard to build something of a niche helping companies who ‘do beautiful things with houses’. This interest started with working for Icon Architects, a local specialist firm near our office in Fulham, west London. We’ve now been working with Warren and Mark at Icon for some years, and (as is often the case with our clients) we have been lucky enough to work with their friends and suppliers. Having moved to the Chelsea Design Quarter in 2014 – a stone’s throw from the interior design village of King’s Road, Lots Road and Chelsea Harbour Design Centre itself – we’re very much enjoying working with our new neighbours. In our work we more often than not work in two dimensions: essentially we design flat things. So it’s always fantastic working with our colleagues in the three dimensional field. Following agreement of the identity, we followed Indigo’s brief to create a ‘frame for our work’ where the website and its navigation allowed the users’ primary focus to be on their work and its detail. We took the idea of ‘the frame’ quite literally here, devising a responsive site with a graphic device which held their brand and its contents together. 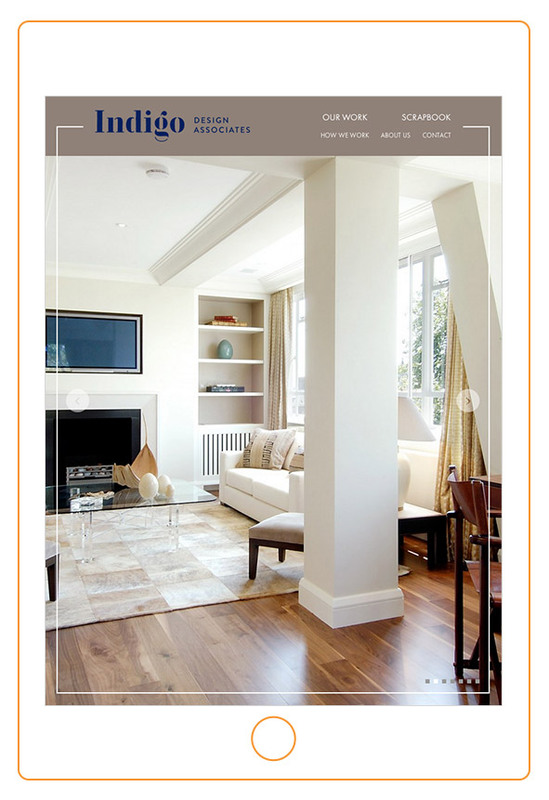 As part of our ongoing work for Indigo Design Associates, we regularly add new project work to their website, meaning it remains a living, growing portfolio. We advise this sort of approach for all our clients. Websites shouldn’t be static or unmoving, rather something that is constantly improving and expanding. All our sites are fully editable, allowing clients to add new work as they go, though some simply prefer to send us over a collection of new work and ask that we do the work – which of course is our pleasure given the beauty of their contents. Continuing a logical path from architect and interior designer, it’s important to have a team to execute their vision. 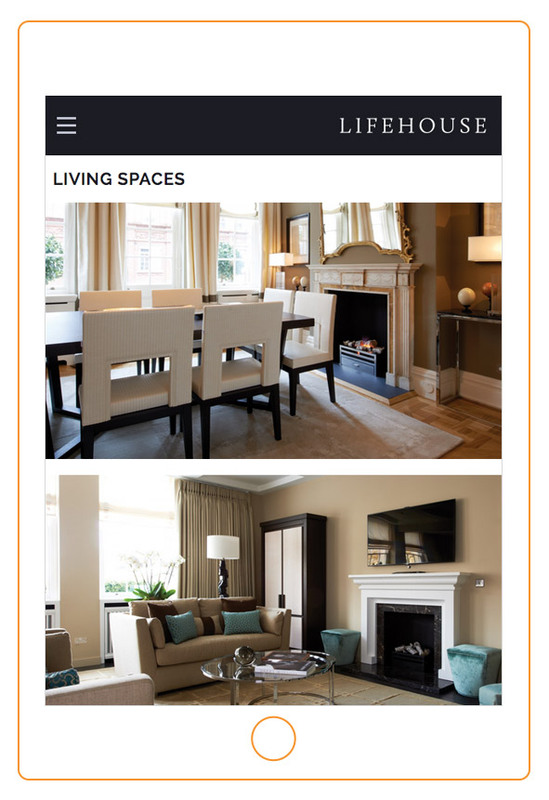 Research had shown that a good proportion of Lifehouse’s clientele tended to select their contractors using personal recommendation and would review these at home, usually on a tablet or laptop. Given this important criteria, we devised a site which would work particularly well in this environment. Central to the design are clean blocks of text positioned over eye-catching imagery. A slight tension we find is that our clients are (very) keen to be easily ‘discoverable’ by search engines, but this involves decent chunks of copy describing their work, which they are less thrilled by. It’s always a goal to find a way of balancing these two requirements, and one which works well here. Having worked with Toby and Georgina at River Woodwork some years ago, it was a real treat to hear from them again with a brief to totally re-imagine their website. With River Woodwork in such hot demand, the purpose of the site was less as a major promotional push, but more as an ongoing record of their incredible work. We were also very fortunate that in addition to the beautifully composed room feature photographs (there’s a niche industry in the photographic business who keep very busy at this sort of work) their creative and industrial processes had been documented in a series of fantastic black and white shots. While we kept the room-set type photos at the centre of the portfolio, it was a real pleasure to contrast these with a more documentary style elsewhere, for instance on the ‘About’ and ‘Design Process’ sections of the site. 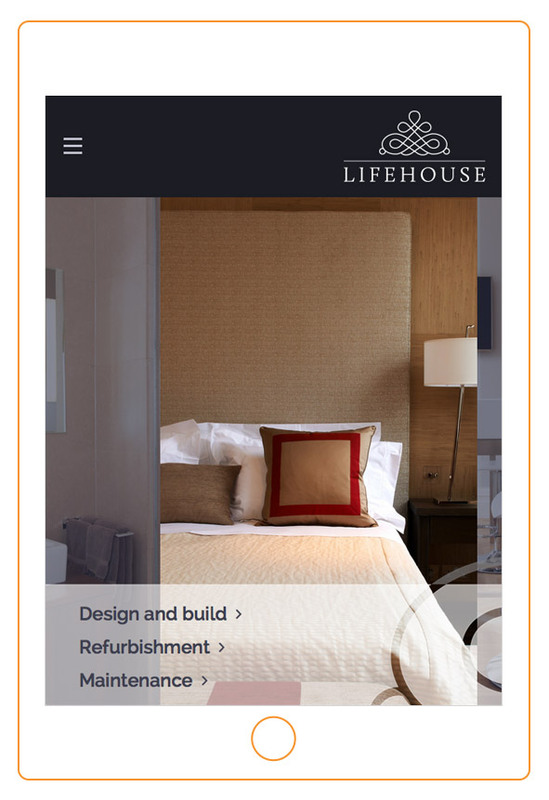 A truly pure portfolio site is rare, as many interiors specialists understandably must focus on the promotion of their work to new customers and the web as a whole. However River Woodwork’s site does both, for us, despite avoiding what are necessary online sales tools like a blog or social media. Working with family business Floor Seasons, we created a new online catalogue and showcase for their exquisite products. Covering wooden floors of every conceivable taste, their attention to detail and curation for each customer is inspiring. 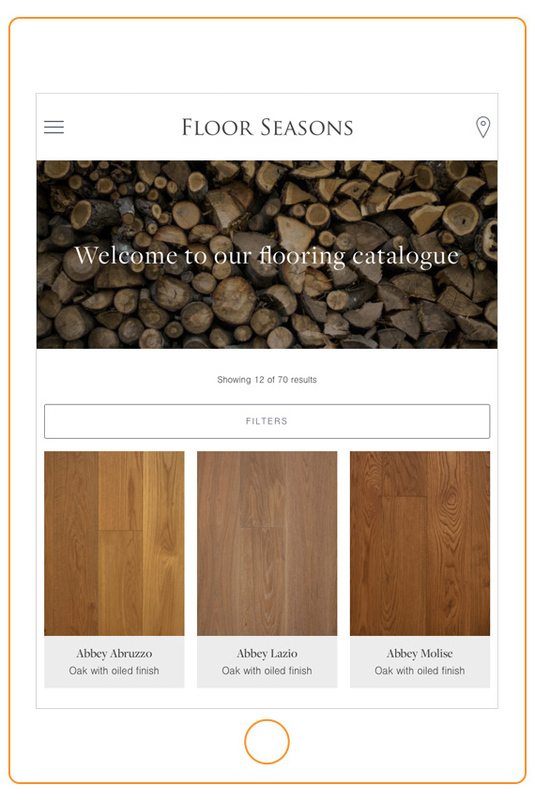 The new website includes their full set of flooring, with the ability to filter the huge range by finish and colour, and then flip between images of a close-up of their product and the finished object in situ. This site marks a part of an ongoing quest for us – to work with more members of the esteemed Chelsea Design Quarter on our doorstep here in SW10. 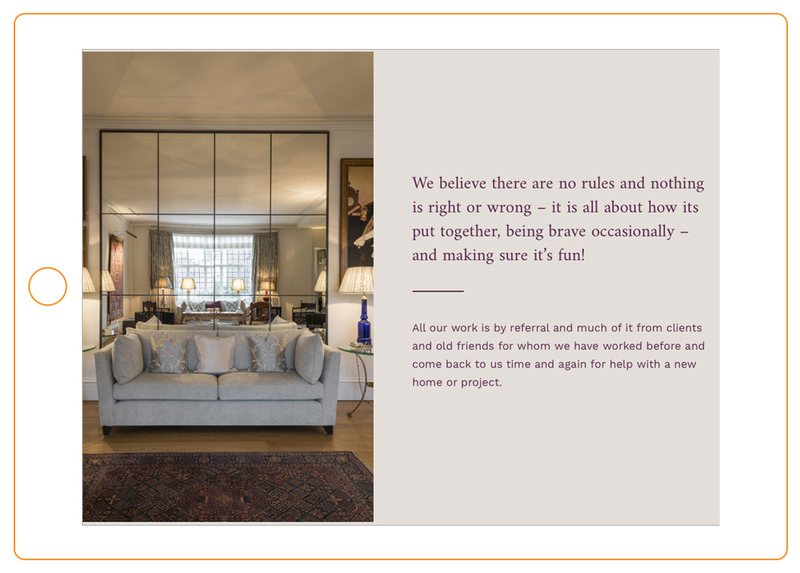 Having worked so widely on all manner of projects focussed web design for interiors specialists, it’s a privilege to now be a local design house working with a premium business such as Floor Seasons. While it’s not strictly speaking an interior exactly, many people regard their garden as a room of their house. Certainly, any room that has windows which look over a garden might feel it’s a natural extension of the space. 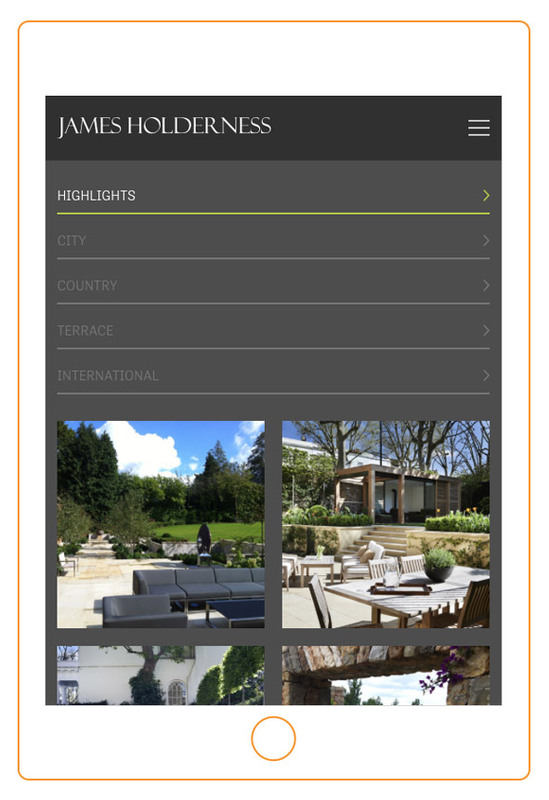 So while it’s a bit of a stretch, we’re very happy that James Holderness Landscape Design is featured here. … and we love working with landscape designers and the companies that execute their vision – and would love to do more work of this kind. We have aspirational green fingers, what can we say. Having completed a site for James some years ago that was more limited in scope, James asked us to rework his online presence entirely to focus on the wide scope of his work which had expanded beyond London clientele to focus on work internationally including Ibiza and the Caribbean. The new site is as tablet-friendly as we could make it, knowing full well that James’s clients are most likely to be swapping his credentials via email and text. We were keen that in addition to the great photos, it was super-clear that the work – and thus skills – available were broad and extensive, so the navigation was put more front and centre to emphasise this. A site like James’s offers ample scope for expansion over time, both in terms of new projects and other genres of work. In particular we liked the idea of a client arriving at the site and deciding that they would like a general review, so tapping on the ‘highlights’ section. 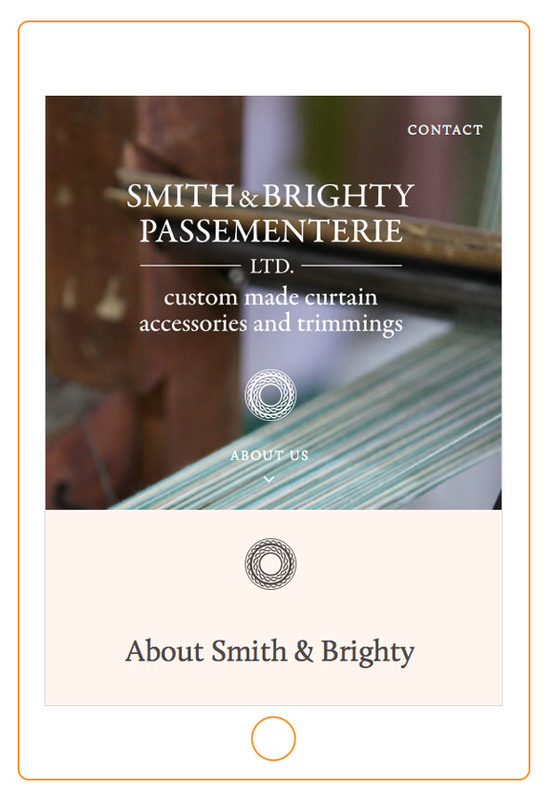 The firm of Smith & Brighty Passementerie was revived to great success in 2013, by founder Jane Brighty. With a few mutual clients, we met up and discussed a new website. Jane was keen to start gently, focussing on a ‘calling card’, one-page site explaining core services with lots of beautiful photos. We had two small problems, however – there were no photos, and the passementerie was all hand-made in Lisbon. Fortuitously, Richard had a holiday planned in the Portuguese capital, and so we held off launching the site a few weeks til he had been, visited the workshop and taken a wide range of shots for the website. It’s a simple website, but works well for a niche business with a specific set of core services, so fulfilled the brief well. The bold photography helps a lot, allowing the tradition and classic approach to creating passementerie to shine through, all the while making it clear that it’s a craft that is very much still alive and working hard. With clients around the UK and beyond, Smith & Brighty needed their foothold on the web so that those ‘in the know’ or generous enough to pass around the name of the company, could easily locate Jane and her team to place an order. 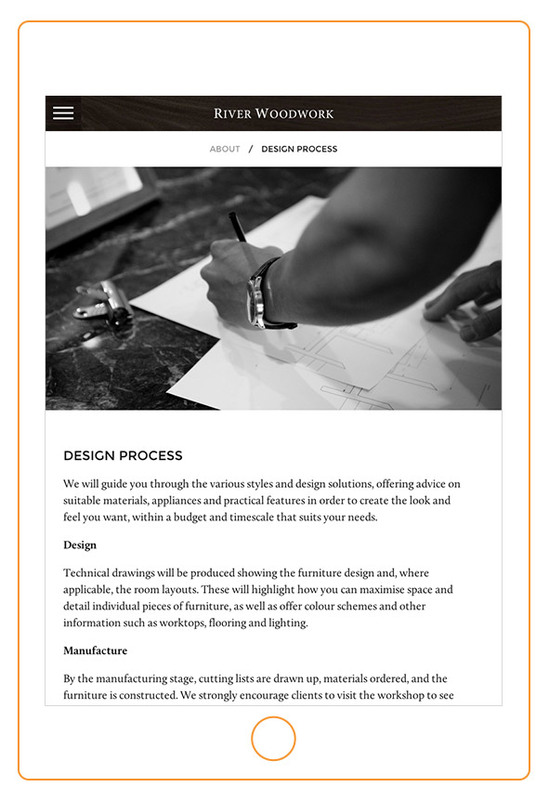 Ultimately this simple process of creating a portfolio to make it easier to spread the word about the work of a creative business is what makes a bespoke designed website, large or small, such a sound investment.